Lewis is best known for his career as a Raven, where he helped the team win Super Bowl XXXV as a rookie. Lewis is also known for his outstanding 2003 season, where he rushed for 2,066 yards, which is third-most of all-time, behind Eric Dickerson and Adrian Peterson. That same year, Lewis also rushed for 295 yards in one game, which was the single-game record until Adrian Peterson rushed for 296 yards in 2007. Lewis was inducted into the Ravens' Ring of Honor on September 27, 2012. Lewis attended Douglass High School in Atlanta, Georgia, where he was a letterman in football and track. Lewis was rated the top RB prospect in the nation by Super Prep. Prep Star rated him as the No. 2 southern RB. Lewis rushed for 25 TD as a senior and earned AAAA All-State and All-City honors. He was named MVP of the Georgia-Florida All-Star Game, with 137 yards on 11 carries (12.4 avg.) and 2 TDs. Lewis gained 1,923 yards and scored 28 TDs as a junior and 1,240 yards and 15 TDs as a sophomore. In his three years as a starter, he rushed for a school-record 4,879 yards and 68 TDs, plus had a 9.7-yard average per carry. While at Douglass, Lewis went from a fullback to the starting running back. In track & field, Lewis was a standout sprinter. He got personal-best times of 10.84 seconds in the 100 meters and 22.04 seconds in the 200 meters. He was also a member of the 4x100m (42.14s) relay squad. In his three year career at the University of Tennessee, Lewis rushed for 2,677 yards and accounted for 3,161 all-purpose. Lewis stands fifth on the university's list of all-time rushers and fourth in all-purpose yards. As a freshman in 1997, Lewis rushed for 1,364 yards and seven touchdowns. For his efforts, he was named first team Freshman All-America by The Sporting News and second-team All-SEC by the Associated Press. In 1998, Jamal suffered a torn lateral collateral ligament in his right knee and missed the rest of the season. He was an arts and science major. He played with former Indianapolis Colts (and now retired) quarterback Peyton Manning. Regarded as the best available tailback alongside Thomas Jones, Lewis was the fifth pick overall in the 2000 NFL Draft by the Baltimore Ravens. In his rookie season, he rushed for over 1,300 yards, supplanting Priest Holmes as the team's starting running back. On November 19, Lewis became the youngest player since 1960 to record 200 yards from scrimmage (21 years, 82 days). The Ravens' running game and punishing defense earned them their first World Championship when they defeated the New York Giants in Super Bowl XXXV. Lewis rushed for 103 yards and scored a touchdown in the game, becoming only the second rookie ever to rush for over 100 yards in a Super Bowl and the youngest player to score a touchdown in a Super Bowl (21). He missed his sophomore year due to a knee injury he sustained in training camp. This weakened the Ravens running game for much of the season. In the 2003 season, Lewis led the NFL in rushing with 2,066 yards, falling just 39 yards short of the all time single season rushing record, which remains Eric Dickerson's 2,105 yards in 1984. Lewis joined Dickerson, Terrell Davis, Barry Sanders, and O. J. Simpson as the only backs in the 2,000 rushing yards club. In 2009, Chris Johnson of the Tennessee Titans, would also surpass the 2,000-yard mark by rushing for 2,006 yards. In 2012, Adrian Peterson of the Minnesota Vikings finished with 2,097 rushing yards, the second-most ever for a running back in a single season. On September 14, 2003, Lewis also broke Corey Dillon's single-game rushing record of 278 yards by running for 295 yards against the Cleveland Browns. Lewis was rewarded by being named NFL Offensive Player of the Year by the Associated Press. Lewis's single-game rushing record was later broken by Adrian Peterson of the Minnesota Vikings on November 4, 2007, when he ran for 296 yards against the San Diego Chargers. 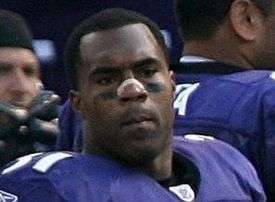 After the 2005 season, the Baltimore Ravens declined to place the franchise tag on Lewis, making him an unrestricted free agent after the end of the season. This move was seen by many as a formality in letting Lewis move to another team. Popular speculation blamed Lewis' steadily declining performance since the 2003 season. Lewis had also voiced displeasure during the 2005 season over the team's failure to sign him to a long term deal. Despite these events the Ravens re-signed Lewis on Monday, March 13, 2006 with a three-year deal, despite having signed former Denver Broncos running back Mike Anderson, who was widely thought to be Lewis' replacement. On November 19, 2006, Lewis rushed for a season-high three touchdowns against the Atlanta Falcons. He ended the season rushing for 1,132 yards, and 9 touchdowns. On February 28, 2007, the Ravens announced that they released Lewis. However, general manager Ozzie Newsome pointed out that they hoped to re-sign him but that changed on March 7, 2007, when Lewis signed a contract with the Cleveland Browns. Lewis (31) lines up to play the San Francisco 49ers in December, 2007. After joining the Browns, Lewis became the team's starting running back. Lewis had his first 1,300+ yard season since 2003 in his first season with the Browns, rushing for 1,304 yards and 9 touchdowns. In January 2015, Lewis began working as the VP of Business and Development for Metro Exhibits, a trade show exhibits company. ↑ Zisner, Lynn. "PRO FOOTBALL; Jamal Lewis Charged in Drug Case", The New York Times, February 26, 2004. "At the time of the alleged crime, Lewis, who had graduated from Douglass High School in Hawaii, was waiting to attend his first N.F.L. training camp." ↑ "Ravens' Pro Bowl runner Jamal Lewis released". espn.com. 2007-02-28. Retrieved 2008-01-27. ↑ "Lewis expected to turn himself in Thursday". espn.com. 2004-02-26. Retrieved 2008-01-27. ↑ "Regions Bank suing former NFL player over unpaid loan". al.com. 2011-11-01. Retrieved 2011-11-01. ↑ Rovell, Darren (2015-02-09). "Jamal Lewis' ring sold in auction". espn.go.com. Retrieved 2015-02-09. ↑ Smith, Michael David (2015-02-09). "Jamal Lewis sells a Super Bowl ring for $50,820". nbcsports.com. Retrieved 2015-02-09.